Some thirty thousand people gathered at the Penta Hotel in Manhattan in November for the annual Whole Life Expo. 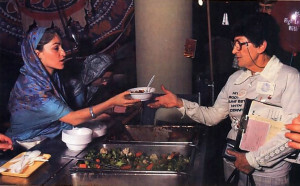 Many saw an exhibit by ISKCON or tasted food offered to Krsna (prasadam). ISKCON devotees had two booths, one for distributing prasadam and the other for showing Krsna conscious videos and distributing Krsna conscious literature. Chatsworth, South Africa—Thousands attended Diwali celebrations here recently at the nearly-completed Sri Sri Radha-Radhanatha temple. 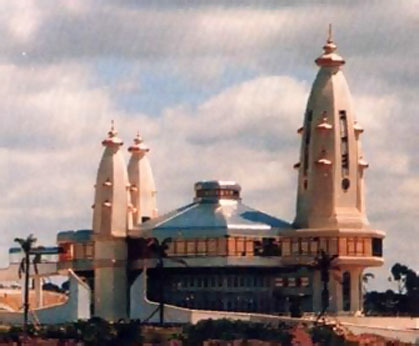 The temple, covering more than four hilltop acres, is the joint effort of ISKCON devotees and South Africa’s Indian community. A color picture of the new temple appeared on the front page of a Durban Daily News supplement, and the Durban Sunday Tribune featured a full-page photo. The Daily News also stated that the temple is destined to become a popular landmark in South Africa. 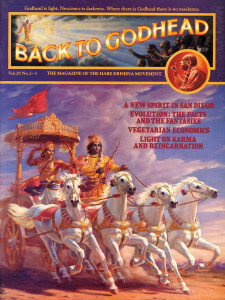 The Bahamas—In a cover-story interview here on diet and society for the December issue of Vegetarian Times, Annie Lennox, the lead singer of the Eurythmics, expressed her understanding of the philosophy of Krsna consciousness. 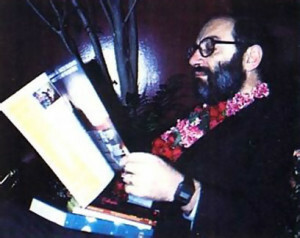 Scholar and novelist Umberto Eco receives gifts of Lord Krsna’s garland and Krsna conscious literature at ISKCON’s Brooklyn center. Brooklyn, New York—Umberto Eco, the author of the international best seller Name of the Rose, met Srila Ramesvara Swami. one of ISKCON’s present spiritual masters, at the Hare Krsna center here in November. During this visit Professor and Mrs. Eco saw Sri Sri Radha-Govinda, the presiding Deities, and enjoyed a luncheon with Srila Ramesvara Swami, BACK TO GODHEAD writer Ravindra-svarupa dasa, his wife Saudamani-devi dasi, temple president Laksmi-Nrsimha dasa, and public affairs director Nayanabhirama dasa, who arranged the meeting. Mr. Eco enjoyed being entertained during lunch by boys from ISKCON’s school in Lake Huntington, who chanted verses from the Bhagavad-gita. Mr. Eco, professor of semiotics at the University of Bologna, was a visiting professor at Columbia University last autumn. He lives in Milan and looks forward to visiting the Hare Krsna restaurant there when he returns. When he comes back to America this summer, he hopes to visit the Bhaktivedanta Cultural Center in Detroit.